"I love the sportsguard Dr. Melissa made for me. I don't have to worry about getting my teeth hit when I play basketball." Under Armour Perfomance Mouthwear has been designed and engineered to unlock abilities that are inside you but can be blocked by the human body's reflex system- teeth clenching. When people train or compete, the natural reaction is to clench your teeth. This leads to excessive amounts of stress hormones such as cortisol, which sap performance and produce fatigue, stress, and distraction. This new technology, developed by the company Bite Tech, specializes in performance mouthwear which prevents your teeth from clenching and pivots your jaw forward. This position relieves pressure on the jaw joint, keeping excessive negative hormones from being produced. This jaw position also improves airway opening. Research has shown that strength is improved by an average of 17% and lactic acid build-up is decreased by 25% by wearing the Under Armour Performance Mouthwear. Studies also show an improvement in responding to auditory and visual cues which could speed reaction time. It is amazing something as simple as a custom mouthguard could actually increase physical performance. This technology is backed by some of the biggest names in professional sports, and recommended by professional trainers and strength coaches. What is Under Armour Performance Mouthwear? Under Armour Performance Mouthwear™ is a completely new category of performance gear designed for all athletes looking to get better in their chosen sport. 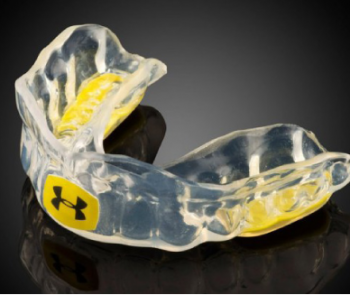 How Does UA Performance Mouthwear™ Differ From Mouthguards? Mouthguards provide protection. UA Performance Mouthwear, which includes mouthpieces and mouthguards powered by ArmourBite™ Technology, does more: It enhances performance. It is not only backed by some of the biggest names in pro sports, it’s also recommended by dentists, pro trainers, strength coaches and wellness experts. Clenching the jaw triggers the production and release of a cascade of hormones, including cortisol, the stress hormone. UA Performance Mouthwear powered by ArmourBite™ Technology prevents teeth clenching and relieves pressure on the temporomandibular joint (TMJ). By preventing the excessive production of hormones, the body is able to unlock its full potential. Are There Research Studies To Support The Performance Claims? Absolutely. There are studies published in peer-reviewed journals to support the claims. More information is available online at www.bitetech.com.